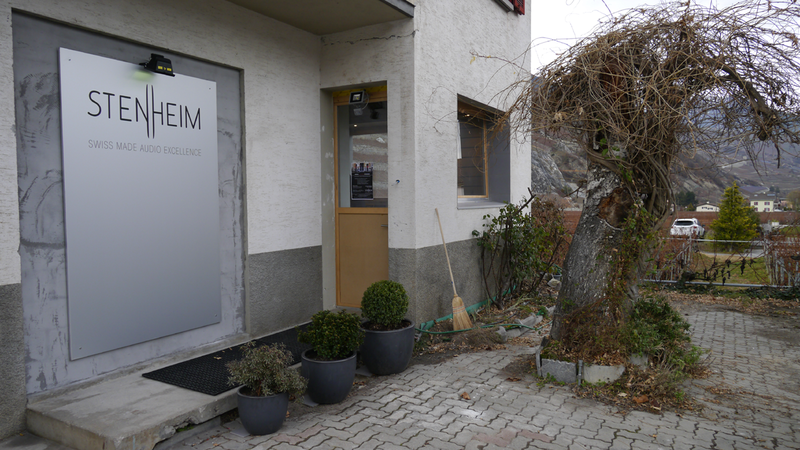 On December 11th, Stenheim opened the doors to their new show room on Chemin des Gorges in Vétroz, a small town nestled in the Swiss vineyards of the Rhône valley past Martigny. 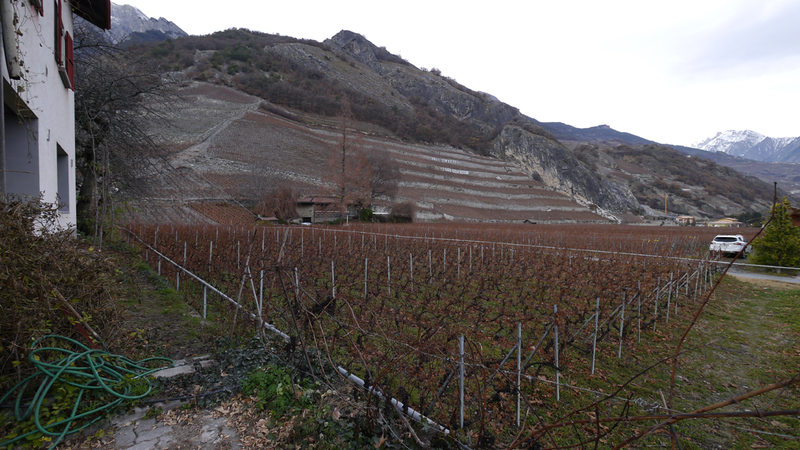 That time of the year obviously wasn't the most opportune to see the surrounding area at its best but this view from behind their building gives an indication how the vines would transform the panorama during the summer and fall. 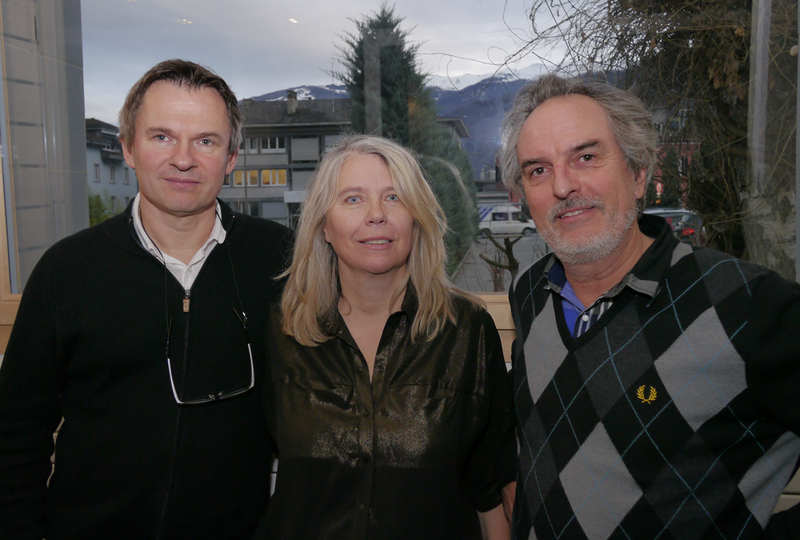 Our hosts were Jean-Pascal Panchard and Pascal Rey of Stenheim and architectural partner Yves Coppey whose wife runs the 3-bedroom Belalp B&B in downtown Montreux. 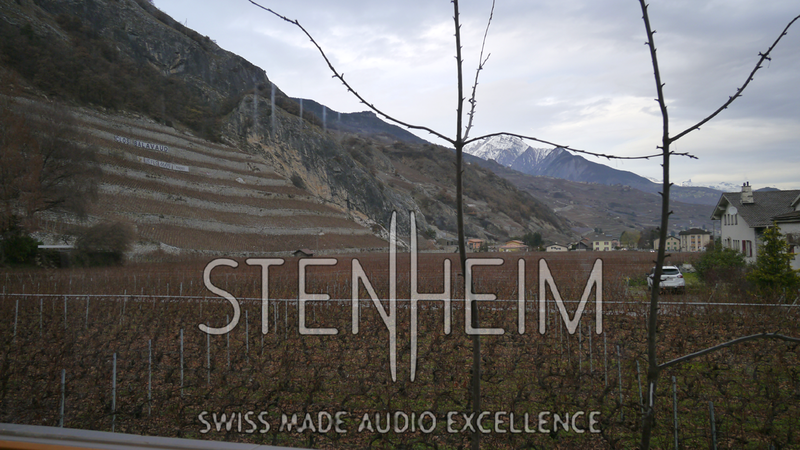 Whilst the Stenheim Reference speakers had premiered in the Kempinski hotel during the 2014 HighEnd Munich show, this grand opening was the first time they could be heard in Switzerland proper. With Yves responsible for the design, layout and acoustical treatments of the space, he told me that still more was to come by way of a multi-media installation that will accompany music with mood-enhancing pictures. 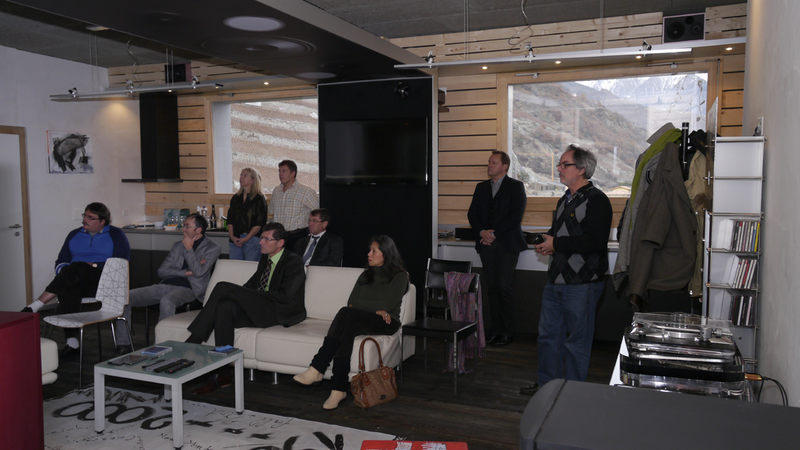 Already there were two large television screens installed on either end of the room's central axis plus a projector and motorized screen. But the wall with the central painting in the photo below wasn't yet finished so a future visit will report on the final installation. 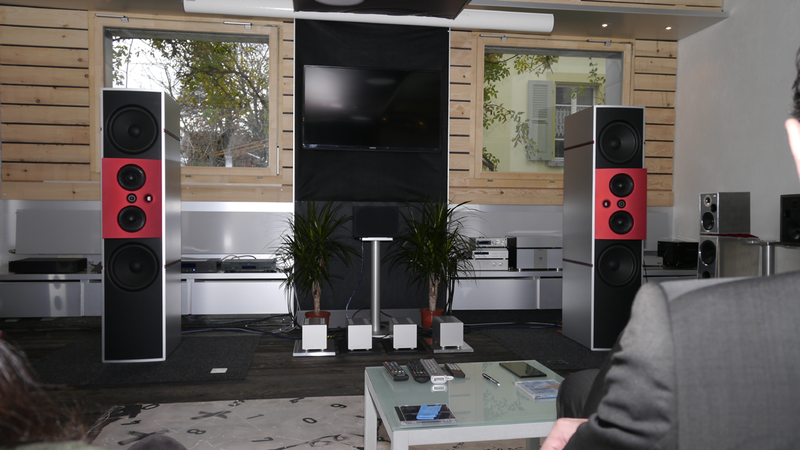 In the next photo we see Stenheim's CEO Jean-Pascal readying a playlist to present the 4-way Reference speakers to his audience. The red-anodized motorized MTM module is remote activated to adjust its dispersion angle without having to move the 240kg and 167x37x56cm HxWxD all-aluminium towers. Per channel, those sport 4 x 32cm woofers (two front, two rear firing), 2 x 17cm mids, 1 x 2.54cm dome tweeter and 1 x ribbon super tweeter. In the center of the back wall hides a projector and right below the ceiling can be seen two horizontally positioned Stenheim Alumine 2-way rear channels for home theatre or surround-sound music. 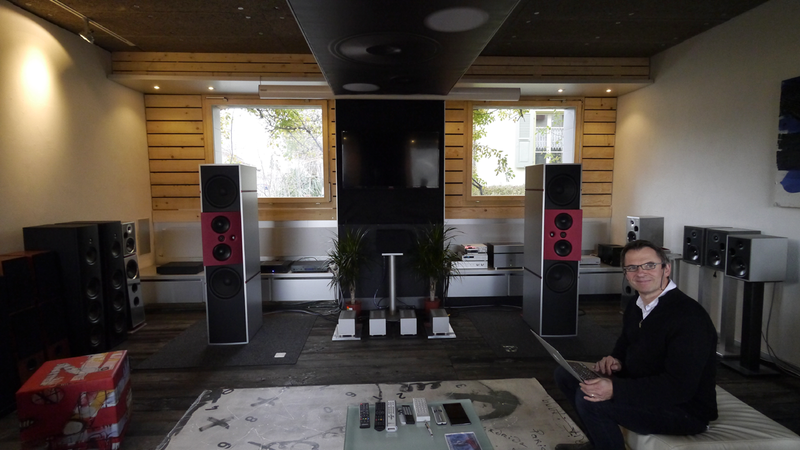 The main speakers stand on isolated isles of solid concrete to decouple them from the ancient barn-oak flooring. 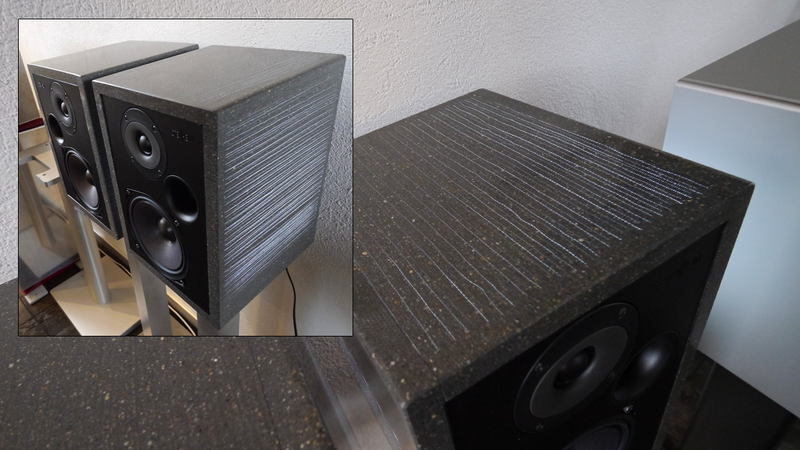 The right side wall housed a compact system to demo the Alumine 2-way whilst the next shot also shows the extent to which the MTM module of the Reference can be rotated. Ancillary electronics for the big rig were nearly exclusively Swiss by way of Nagra and Neukomm. Only the La Rosita server crossed the border into France. 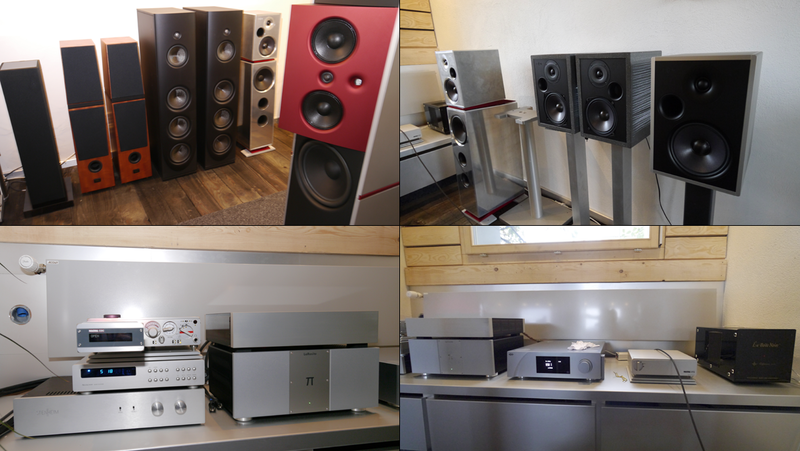 Also in residence were a pair of stainless steel finished Stenheim Alumine 3-ways, a prototype pair of Alumine two-ways in a new concrete/stone composite enclosure wickedly lit from within; a pair of Canadian Verity Audio three-ways and a pair of Magico Q3. Here is a closer gander at those prototype composite concrete cabs. 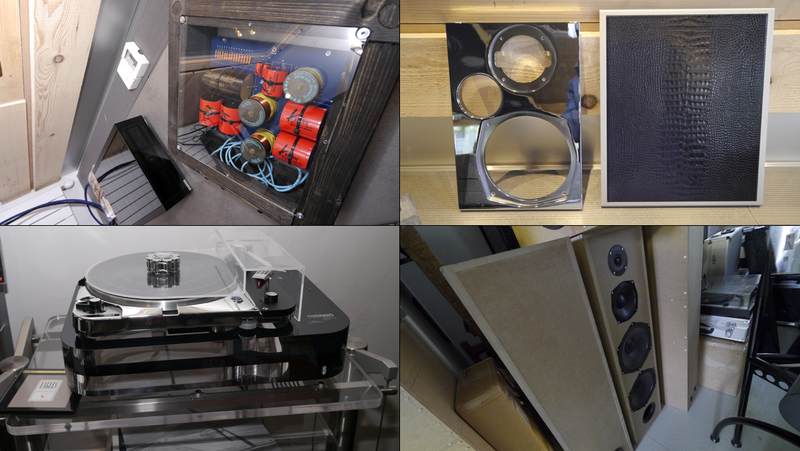 The next photo shows an externalized display crossover for the Alumine 3-way; a chromed front baffle and faux alligator leather-clad side panel of the bespoke-optioned monitor; a Thorens turntable; and a spy view at a prototype of the forthcoming Grand Alumine twin-woofer 3-way tower still in an MDF box. Here's a closing look out the Stenheim studio window facing east. 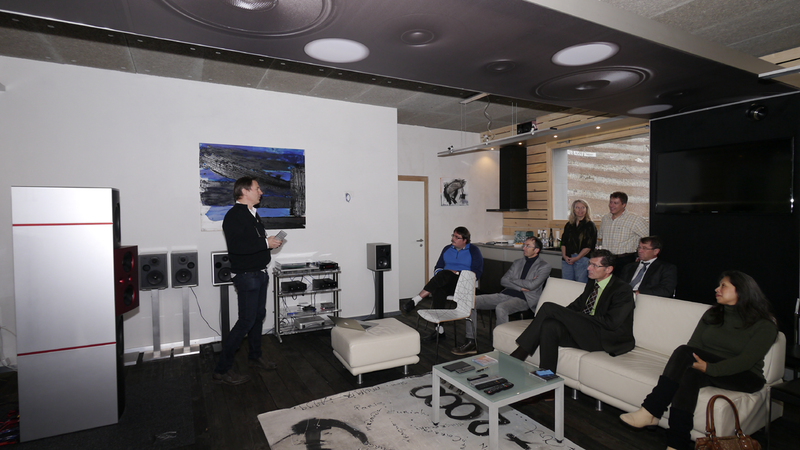 Operating by appointment for prospective buyers and also as a demo facility for visiting Stenheim dealers and distributors, a second function of this new space is to support R&D on new models. 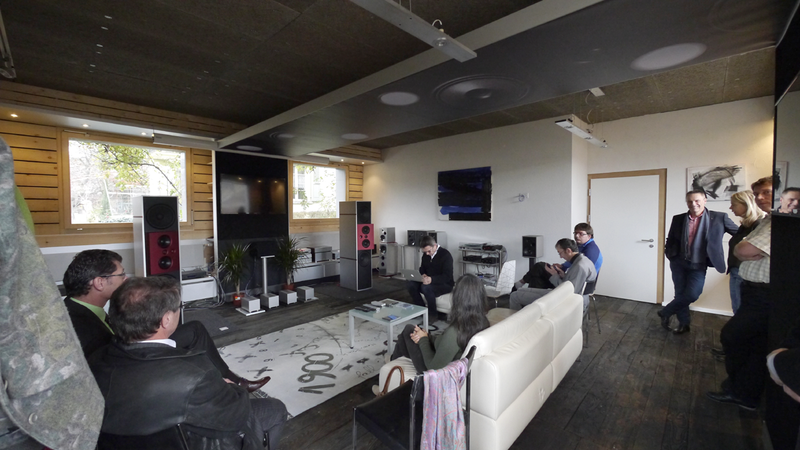 That's by way of a small attached workshop which will exploit the professionally dimensioned and optimized listening room of proper size for tests and critical auditions.